In Entity-Relationship Parts I, II, and III, I described a method of normalization that builds up from individual data elements. Following this method results in a database design that is normalized to the Third Normal Form -- without having to know what the Normal Forms are. In Part III, I left off with the completed Entity-Relationship Diagram shown in Figure 1. When I do E-R diagramming, I like to ignore the attributes, concentrating instead on just the entities and their relationships. But at some point, obviously, the attributes have to come back into it. I like to save that to the end. There are some good E-R diagramming tools available out there, like Visio and ERWin, but for small projects, I usually just implement the tables directly in Access and create the Relationships there. 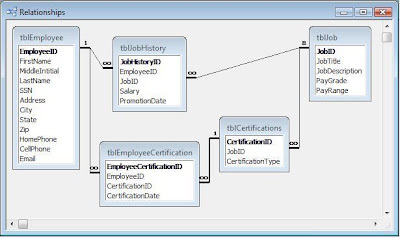 The Access Relationship Window works pretty well as a diagramming tool, and you've got a completed database at the end. So far, I've talked about Entities and Attributes. I do that deliberately to keep myself from thinking about implementation issues while I'm designing the data model. 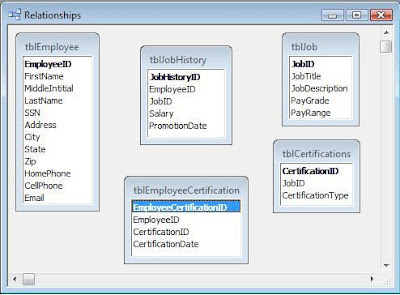 But at the implementation phase, entities become tables and attributes become fields. The first thing I do is add an Autonumber, Primary Key field (Surrogate Key), to each table, naming it after the table with a suffix of "ID". Thus the tblEmployee table will have a field EmployeeID. Then I create a Unique Index on the Natural Key I identified during E-R diagramming process. At this point, my tables look like Figure 2. Now it's time to look at my relationships. Relationships are created on fields holding related information, Primary Key to Foreign Key. In a One-to-Many (1:M) relationship, the primary key of the table on the "One" side is added to the table on the "Many" side table and becomes the foreign key. Since there is a 1:M relationship between tblEmployee and tblEmployeeCertification, I'll put EmployeeID in EmployeeCertification and it will become the foreign key for tblEmployee. I'll do the same with every relationship. The resultant tables look like Figure 3. Lastly, I need to create the actual relationships. I do this by clicking and dragging the primary key of one table into its corresponding foreign key in the other. For instance, I'll click on EmployeeID in tblEmployee and drag it to EmployeeID in tblJobHistory. When I do, I will get an "Edit Relationships" dialog box shown in Figure 4. The Referential Integrity box will not be checked by default. However, you MUST check it in order to create a true relationship. Without it, Access will create a line between the tables, but it will NOT be a relationship. 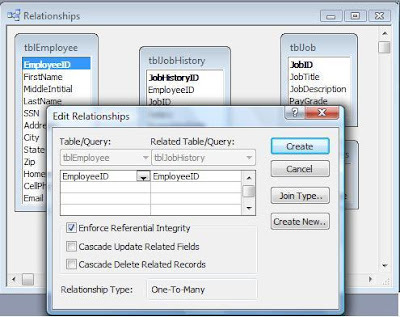 When you click the Referential Integrity box, Access should correctly identify the relationship as a One-to-Many relationship. If it does not, if it says Indeterminate, you've done something wrong. Clicking OK results in the relationship being created. Figure 5 shows that. 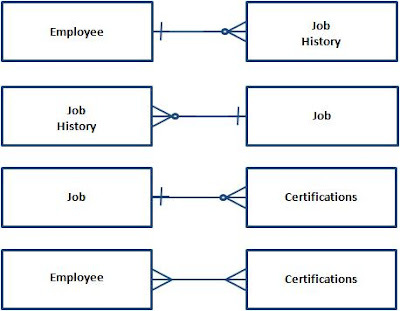 Figure 5: Relationship Between tblEmployee and tblJobHistory. Now, I'll just do that for the rest of the relationships, and I'm done. The process I've outlined here is really just the bare bones. If you're interested in seeing examples in more detail, you can find some in the Tutorials: Database Design section of my website. In this Entity-Relationship series, I'm attempting to present an alternative to standard, decomposition-style normalization. 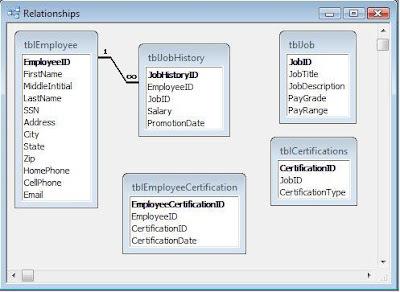 In Entity-Relationship Diagramming: Part I, I grouped all the objects in my business narrative into either Entities or Attributes. Entities are groups of Attributes and Attribute describe Entities. In Entity-Relationship Diagramming Part II, I defined the relationships between my entities. 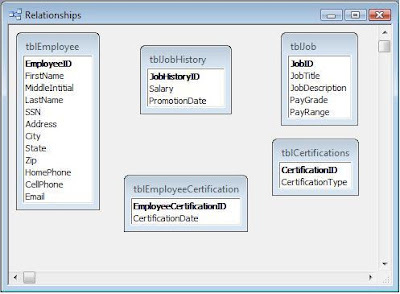 Relationships store information about how your Entities interact. Figure 1 shows where I left off. Figure 1: Relationships Between Entities. Unfortunately, I'm not done yet, for two reasons: 1) as I said in What is Normalization: Part V, many-to-many relationships cannot be directly implemented in a relational database, and 2) I still have an unassigned attribute. So first I'll rationalize the many-to-many relationship and then take another look. To rationalize a many-to-many relationship between two tables, you create a third table -- an "intersection" or "linking" table. Then you create one-to-many relationships between the linking table and each of the main tables, with the "many-side" of both relationships on the linking table. 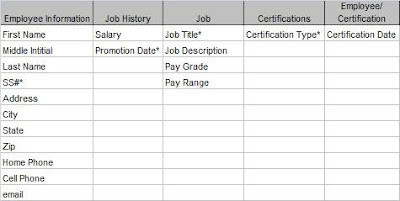 As you can see above, Employee and Certifications have a many-to-many relationship, so I need to create a new entity (Employee/Certifications). Sometimes linking tables have logical names. Other times, they don't. In that case, I simply combine the names of the base tables. Figure 2 shows how the rationalized relationship is diagramed. Now I can see where to put my unassigned Certification Date field. The Employee/Certification entity represents a certification for a particular employee and that can be given at only one time. Therefore the Certification Date field goes in this new entity. Figure 3 shows the completed Attribute Grid. Now that I've got all the relationships between my entities identified and assigned all the attributes, I can put it all into one diagram. Now I've got all the pieces. All that's left is to implement my diagram in Access (or some other database). In Entity-Relationship Diagramming: Part IV, I'll do just that.